Norlift has the opportunity to work with many diverse and wonderful companies, and we would like to highlight one in a customer spotlight: Zoiglhaus Brewing Company. We appreciate their business and want to share their story. Amidst the construction and budding environment of SE Portland, a brewery grows. However, Zoiglhaus is more than just a brewery as they pay homage to traditional 'Zoigl' communities by focusing on tradition, community, and family. From a well-stocked children's play area to authentic housemade German food and beer, the community can experience the difference. Zoigl-style beer production originated from communal brew-houses in Eastern Bavaria during the 15th century. By pooling money together, the communities could afford higher quality brewing equipment. The pre-fermented beer, or wort, was brewed in the communal brewery, and when ready, families would take some of the wort home to ferment. As the beer completed the fermentation process, the community gathered in one another's homes to drink, eat, and enjoy their company. To keep the idea of Zoigl-wort sharing alive, Zoiglhaus offers a unique experience to homebrewers. Every twelve weeks, homebrewers may come in to purchase wort to ferment at home (dates are announced on Facebook). Depending on the yeast, hops, malt, and any additional changes the brewer makes, the beer changes in taste and aroma. After six weeks, the homebrewers bring their distinctive beer back to Zoiglhaus to enjoy with one another. Those who don't homebrew can still seize the opportunity to taste great Portland brewed beer. Zoiglhaus offers a wide variety of craft beers, hard ciders, wines, non-alcoholic, and gluten free beers for everyday visitors to taste at their bar. Through the assortment of drinks on hand, the community can sample Portland from one friendly location. Zoiglhaus invested in Norlift equipment to help facilitate the growth in their beer production. 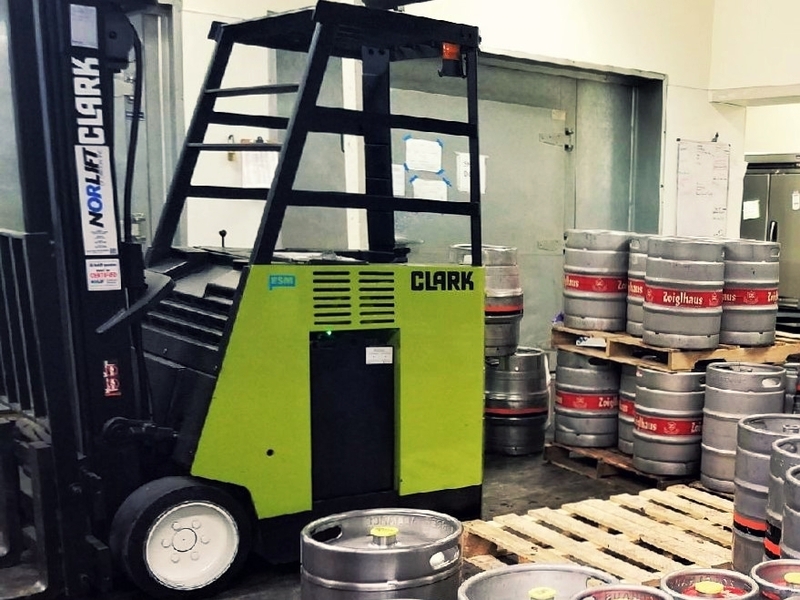 An electric Clark stand-up forklift and a Doosan pallet jack are busy at work in the brewing facility. Together, these machines help the brewery move pallets of kegs, bottles, and raw materials quickly and efficiently, allowing the brewers more time to brew and experiment with their craft. Zoiglhaus offers more than just tasty brews; they offer a community for all who enter. Voted as one of the best family friendly restaurants in Portland by PDX Parent, be sure to swing by with the whole family, and enjoy the friendly and welcoming environment. Visit Zoiglhaus in SE Portland at: 5716 SE 92nd Ave, Portland OR 97266. To inquire about how we can help your company, give us a call (503) 659-5438. Or click the button to send us a inquiry.